The sole source of magic is the Blue Crystal. Its lines of force radiate outward to infinity, permeating all matter except white crystals, which block and absorb the magic force lines. All magic needs both blue and white crystals – they act like poles of a magnet. However, blue crystal no longer exists naturally. All smaller blue crystals have been sucked dry of magic force, leaving them a dull white color, which neither inhibit nor radiate magic lines of force. Pain and fear are the bane of wizards. The existence of either sensation is sensed by the Blue Crystal, which then dampens the capacity of the magic force lines to transfer energy. The effect drops off with the square of the distance from the source of the emotion. This will prevent a spell from actuating, and cause existing spells to dissipate. A completed prophecy will come to pass. If a wizard speaks during a spell, and those words are heard by anyone else, and the words can be interpreted as specifying a particular future event of condition, then the words are taken literally by the Blue Crystal as inputs for the probability matrix. 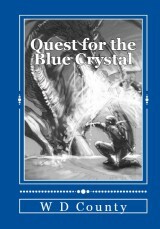 If a chain of plausible events can be identified that leads to the stated result, then the Blue Crystal will assimilate the ‘prophecy’ into its matrix and will thereafter act promptly and forcefully to ensure the realization of the prophecy. However, if no credible chain of events can be identified, then the Crystal will kill the seer before the spell finishes. Note that the Crystal does not limit its own capacity for magic even if pain or fear will result. Energy is required for all magic. The amount of energy required is directly proportional to the difference in the energy states of the physical systems involved before and after the spell, plus that required for any dynamic interactions during the spell itself. Incongruities will not persist. When a spell fades, all effects that are not consistent with existing natural laws will terminate. If a spell involves permanent altering of a natural law, then all phenomena within the boundaries of the spell (usually the Salminerian universe) will be altered to confirm to the new laws if the spell caster can tap into a sufficient energy source to accomplish the altercations; otherwise the spell will simply fail to actuate. The will of the many outweighs the will of the few. Higher-level spells take absolute precedence over lower levels. ‘Level’ refers to the number of magic users that have combined their minds to cast a spell. The Blue Crystal prevents any lower levels from opposing a higher-level spell, regardless of how much energy is expended. The mind is closed to uninvited magic. No spell can be cast by or on a sleeping, unconscious or just closed minded person. If the Crystal does not detect conscious brain waves and an openness to magic, it will not let spells actuate that affect that person’s brain or body.